"I've got a case I might need some help with." That's how it usually starts when someone, usually a first or second chair litigator, reaches out to me at A2L Consulting. What happens next is not something that I have discussed publicly a great deal. But there’s no reason not to. It actually represents a well-honed process that we have developed over the last 18 years that helps trial teams try cases more effectively. Our process is unique and special. I want to share an overview of that process, because when you understand it, you can appreciate how we, as jury & trial consultants and as trial graphics experts, help many of the top trial lawyers in the nation prepare for trial. Step 1: We request as many documents as will be helpful and relevant – pleadings, briefs (both sides), outlines, proof charts, key pieces of evidence, bad docs -- anything that has been developed by the trial team that will be useful in proving their case. Step 2: We conduct an initial brainstorming session, sometimes using mind-mapping tools. Our goal is to understand the case and appreciate its basic strengths and weaknesses. This helps us craft a recommendation about how we should use mock trials and demonstrative evidence in our trial preparation. Step 3: We meet with the trial team to hear the case from the team’s perspective. Very often we learn at this meeting that certain points warrant more emphasis than others in the trial presentation. We also find out what the key strengths and weakness of our client’s case may be, as opposed to what they may have said in their briefs. Litigators will often tell us that this step was critical to their success as it was the first time they had to try to convince someone of the merits of the case, and we helped them do this much earlier than they would have naturally done. Step 4: We return to our office and form a team generally comprising between three and 10 people. The team will be made up of some combination of Ph.D. jury consultants, former litigators, information designers, trial technologists, and others. Then we organize a formal brainstorming session that includes members of this team as well as others from A2L who have no familiarity with the case. At this point, we present quickly both sides of the case and highlight key strengths and weaknesses. From this effort we gather common-sense reactions and learn more about the emotional triggers in the case. Step 5: We brainstorm an initial trial graphics list and start to make decisions about what might work and what might not. We often share this list with counsel at this early stage to keep costs down and to get their feedback. Given the attorneys’ extensive familiarity with the case, our initial exhibit list will also prompt them to add other litigation graphics, possibly to delete some graphics, and to come up with other creative ideas at this point. Step 6: We share our thoughts with the team and get some feedback on which demonstrative evidence and litigation graphics to move forward with. Step 7: We prepare the initial litigation graphics as a sort of test run. We run them by the trial team to make sure that we are on the right track and haven’t missed anything important. At this stage, we are usually preparing the basic litigation graphics like litigation timelines, players charts, document call-outs, checklist exhibits, etc, but we might also produce physical scale models or courtroom animations. Step 8: We test our exhibits in a mock setting of some sort. This can be a full mock trial with “jurors,” or it can be a less complicated version like our Micro-Mock format. Step 9: We refine and retest our approach and our litigation graphics based in part on the results of the mock event. Step 10: We sort out and execute our courtroom technology plan. Pretty soon after this step, we will be ready for trial. So, as you can see, what seems like a complex process from the outside actually follows a well-defined set of steps designed to produce the best possible result. Sometimes we execute this process over the course of two years. Sometimes we do a more accelerated version of this process in two weeks. 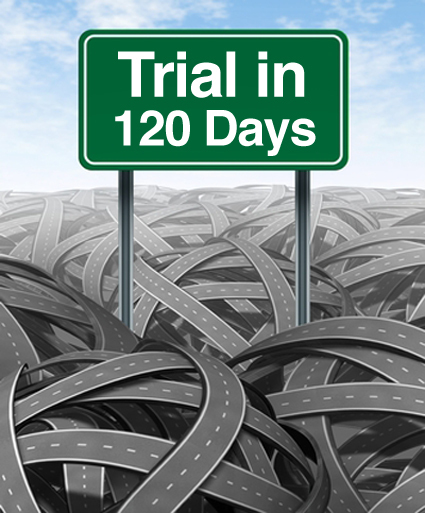 When executed with a great trial team, this process will produce order out of chaos and help litigators tell a simple and persuasive trial story - proof of a job well done.